Like moving your personal household, it’s chaotic, fast-paced, inconvenient and usually painful – in fact more painful than a personal move because there are so many moving parts, so many ways to get it wrong. How can you reduce the pain and get back into gear as fast as possible? This is a chance for a fresh start and a great time to review the way you’re doing things. If you have a clean concrete pad, you have the potential to reinvent your operation, and you should take it. You can mix, move, and reconfigure your facility to meet new challenges. You can add functional areas, remove problem areas and snafus, or just spread out previously cramped work cells or storage areas. 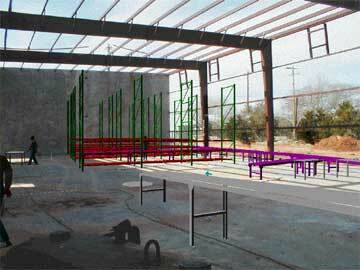 This is a perfect opportunity to optimize your facility layout, to question workflow, and to make long-needed changes. Don’t squander it. Ask yourself and your team questions, and keep challenging old assumptions. Do certain departments truly work best where they were situated in your old facility? Could they perform better if moved or completely reconfigured? Could your storage rack layout be redone to serve your new operation in a more logical way? What components can be transferred over, and what will have to be purchased new? Review your flow. Could you improve your product slotting, order selection system, or material flow? Could you reduce travel times by moving departments around? Imagine your operation the way it should be, not the way it is and then get to specifics. Could you install structural improvements such as a mezzanine to further increase the amount of space available to you in the new facility? Which areas are in need of a complete redesign? Could you implement a 5-S program or lean line at this point, rather than redoing it after you’re already installed and ready to go? Check out our article on the Logic of Facility Layout for more information on the methodology you could employ to approach this. You know the obsolete inventory sitting on your racks or in the corners of your facility with a nice coat of dust? The stuff you have to shuffle around when you need to accommodate new arrivals? Get rid of it. A move is an excellent time to get this done. Auction, sell or otherwise get rid of it before moving day. Make sure you fully know what permits and inspections are required in the new facility, in particular if you are moving to a different state, city, or county. Regulations, code issues, and permitting can vary by multiple jurisdictions, so it’s smart to do your homework at this stage. Putting off this step can delay things more than you can imagine. Be on high alert for theft. Pilferage is never easier than during a move or reconfiguration scenario. When pallets are packed for the movers, or when they are unpacked at the new facility, it’s the easiest opportunity for pilferers to snag tools or inventory items. Often, people outside your organization will have access to your inventory – contractors, temporary workers, or moving companies. To help reduce the issues, assign trusted workers to zones and have a double-check system (in and out) for loads. Be doubly aware for the highest value items. Stretch wrap and mark pallets so that it is easier to tell if they have been tampered with. Account for inventory and re-load it back into its new home as soon as possible once it has been moved. Get the contractors and temps out of your new facility as soon as possible. Be vigilant about product damage. 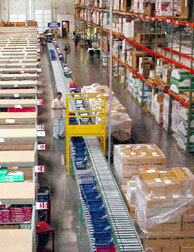 When racks or storage shelving is unloaded, the possibility of spills, bumps, or poor re-packing for the move is high. Whole pallets have been spilled in this process. Assure your workers or movers that you’d rather have it right than fast. Focus on safety. You’re moving a lot of product, a lot of pallets, and tearing down storage racks, conveyor lines, or other machinery in a facility move. People are in roles they aren’t used to. Forklifts will be running in places they usually aren’t allowed, and perhaps you have leased extra lifts to help get things done quickly. Plan what’s going to happen and when so you can minimize these safety issues. If a specific area is being torn out while an adjacent workcell is still operational, be on high alert for unusual patterns that could endanger people in your daily operation. If possible, try to have these tasks done on separate shifts. Have daily meetings and focus like a laser on safety during the move. Try to anticipate issues, and work with the people most directly affected (material handlers, fork lift drivers) constantly. Make sure qualified people are moving valuable equipment. Automated stretch wrappers, milling machines, power conveyor lines, and other machinery don’t travel well if the people who tear it down don’t understand the equipment. In particular when it’s reinstalled in the new facility, it really pays to have qualified professionals doing the work. Cisco-Eagle can help you in any facility renovation or relocation. Contact us for assistance.